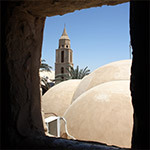 The Coptic Orthodox Church is one of the most ancient Churches in the world, founded in the first century in Egypt by Saint Mark the Apostle and writer of the second Gospel of the New Testament. A conservative Church, it has carefully preserved the Orthodox Christian faith in its earliest form, handing it down through generations, remaining true to the Apostolic doctrines and patterns of worship. The Church’s spiritual approach emphasises holiness, Divine Mysteries and fellowship, rooted firmly in the canons of the Holy Scriptures, the apostolic and Orthodox creeds, the teachings of the Church Fathers and the first three ecumenical councils. Egypt is a land rich in history, blessed by our Lord Jesus Christ Himself. In His infancy, the Lord visited Egypt with His mother Saint Mary, and Saint Joseph during their flight from Israel at the instruction of the angel, and thus Egypt became their second home and a place of refuge (Matthew 2:13-14). The word ‘Copt’ is derived from the Pharaonic word ‘gypt’ and the subsequent Greek word ‘Aigyptus’ meaning ‘Egypt’. Copts are the Christian and indigenous people of Egypt, direct descendants of the ancient Egyptians, a people with perhaps the longest recorded history. When Saint Mark travelled to Egypt on two separate mission trips, he preached the Christian message to many in the land. During his first journey, he met with Ananias, who expressed knowledge of the concept of the ‘one god’, and when this was further explained by Saint Mark within a Christian context, he accepted the faith and was baptised along with his household. Soon afterwards, many others believed and Ananias’ house became a meeting place for the faithful. After witnessing for seven years, Saint Mark was martyred in AD 68 when followers of Serapis (the Serapion-Abbis Greek Egyptian god) attacked the church in which he was praying and dragged him through the streets of Alexandria for two consecutive days. In Eucharistic liturgy, the faithful gather in union to pray, and to partake of the Eucharist, considered to be the Body and Blood of the Lord Jesus Christ. The liturgy is chanted using the Coptic language, alongside the language of the land in which the Church is based, utilising a musical composition that in part dates back to the Pharaonic era. 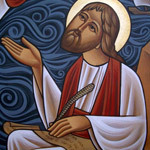 The three divine liturgies celebrated in the Church today are those of Saint Basil, Saint Gregory, and Saint Cyril, based on that used by Saint Mark in the first Century. Parish communities and churches are served by married priests who are nominated from within that parish for its service. Once nominated, their names would be presented to the bishop who would approve and then ordain them for that ministry. Bishops on the other hand, including the Pope, are celibate and are selected from within monastic communities. Monasticism was founded by Saint Anthony the Great towards the end of the third century and thrives in the Church up to the present day. Those living the monastic life in any church or denomination anywhere in the world can trace their roots back to the deserts of Egypt. Although monks did not record their own history, many came from all over the world to benefit from their words, seeking spiritual guidance and documenting their teachings. Western monastic fathers, such as Saints Benedict and John Cassian, came to the deserts of Egypt to experience this way of solitary life and subsequently introduce this to the West, where it was then embraced and became the foundation of monasticism in those parts of the world. Those living the monastic life became tangible sermons, faithfully embodying the life of prayer, contemplation, solitude, worship and purity of heart and ascetism. Stemming from these monastic principles is a deeply rooted ascetic life that is expressed in the practice of fasting. Fasting is another principal foundation in the life of the Church, and of the 365 days of the year, Copts fast for over 210. These periods are considered to be times of spiritual growth and reflection based on prayer and Scripture, during which people observe a period of abstinence at the beginning of the day, followed by a vegan diet. The major fasts in the Coptic calendar are Lent, leading to the Feast of the Resurrection, and Advent, leading to the Feast of the Nativity. Prayer is a fundamental foundation in the life of the Church, and the Agpeya is the book containing the seven prayers observed daily. Arranged to commemorate various events in the life of Christ and the Church, they help to guide the faithful in daily reflection, and are labelled as the first, third, sixth, ninth, eleventh, twelfth and midnight hour. The veil is a separate daily prayer only observed by those in monastic life. Other forms of prayer observed are the Raising of Evening and Morning Incense, Midnight Praises, and Morning and Evening Praises. Within the context of non-ritual gatherings and prayer meetings, contemporary forms of prayer and worship are also used. Seeking the intercession of saints is a valued component in Orthodox practice, although it is sometimes misunderstood as the worship of those saints. The understanding behind intercession is that strength and encouragement can be found in commemorating the life of those who lived faithfully, including the martyrs who died for their faith, and that there is value in asking for their prayers. Historians have named the Coptic Church the ‘Church of Martyrs’, because of the great number of people who died for their faith. During the reign of emperor Diocletian almost one million men, women, and children were killed for their faith in Egypt, and thus to commemorate their sacrifice, the Church determined to commence its calendar, known as ‘Anno Martyrii’, or ‘Year Of the Martyrs,’ in the year 248 AD, the commencement of his reign. Another wave of persecution came when Islam entered Egypt in the 7th Century, bringing a new set of challenges for Christians and the Church. There was now a requirement for the payment of Gezya tax by non-Muslims in exchange for the receipt of ‘protection’. Those who could not pay were faced with the choice of either converting to Islam or losing their civil right for that protection, which generally resulted in many losing their lives. By the beginning of the second millennium AD, in addition to Gezya, Christians suffered from specific limitations, such as restrictions on repairing old churches and building new ones, testifying in court, public conduct, adoption, inheritance, public religious activities, and dress codes. Slowly but steadily, by the end of the 12th century, the face of Egypt changed from being a predominantly Christian to a predominantly Muslim country. Despite persecution, however, the Coptic Church has never been controlled, or allowed itself to control the governments of Egypt. This position of the Church concerning the separation between state and religion stems from the words of the Lord Himself, “Render therefore to Caesar the things that are Caesar’s, and to God the things that are God’s ” (Matthew 22:21). Today, the Coptic Orthodox Church has the largest Christian presence in the Middle East, with approximately 10-15 million members in Egypt, representing about 15 per cent of the population. They vibrantly, actively and faithfully fill their churches and monasteries, living as productive and faithful members of their communities. The Coptic Orthodox Church has also experienced rapid growth in the lands of immigration over the past 30 years, in the United Kingdom, Europe, North America and Australasia. 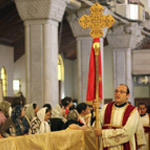 There are now over 15 dioceses and 500 parishes outside Egypt, and the Church continues to flourish by the grace of God. It is worth mentioning at this point that we do not consider our communities living abroad as a diaspora, as 90 per cent of Coptic Christians still live in their native Egypt. This flourishing ministry is the direct result of the Church’s focus on Christian education at every level over the past decades, starting from a vibrant and wide-ranging Sunday School movement, to an active and engaging youth ministry, and continuing in adult education within theological colleges and seminaries, as well as local parish settings. Besides its focus on Christian education, there is also a deep-seated and historical focus on mission. The mission work of the Church has not been limited to the early centuries, but extends to its active and vibrant ministry today. Our philosophy is not to aggressively seek to convert people to the Faith, but rather to follow the teachings of the Lord Jesus Christ in the Gospel of Saint Matthew, when He instructs us saying “Let your light so shine before men, that they may see your good works and glorify your Father in heaven,” and thus attract others to Him in this way. The principal functions of the Church are to care for her flock and to be “a light to the whole world”, attracting people to Christ. In being alive in the world as the Body of Christ, the Church provides a source of hope for all.